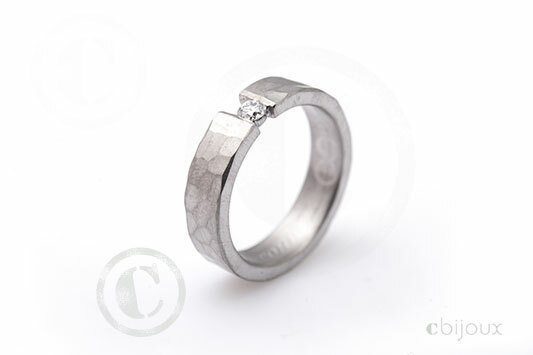 Choosing wedding rings made of palladium is not the most common approach, why? 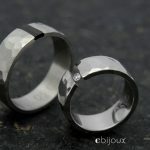 Back to this present article : palladium wedding rings, why choose this metal? I will give you my advice on this metal, its strengths and weaknesses. 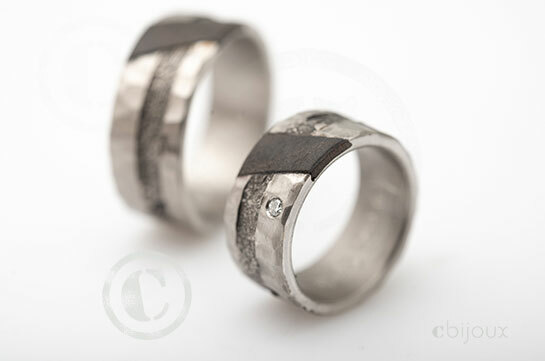 I, who write these lines, have been creating wedding and engagement rings since 2001, under the name of Cbijoux. Since my beginnings and until today, I have always tried to find the right material that could optimally meet the criteria I was looking for. However, common sense and convenience would rather advise me to offer what is most in demand (law of market). I have always preferred to offer the ideal choice, not the most expensive or the cheapest, not the rarest or the most coveted, or even to follow fashion (… especially not), but to offer the best according to the desired criteria! Yes, that’s certainly the reason for my success. But why are most jewellery stores so reasonable? Which metals are the most easily sold? Compared to silver, gold or platinum, palladium is the youngest of the four best-known precious metals, considering when it was discovered. Palladium was born in England in 1803, when the physician and naturalist William Hyde Wollaston determined that palladium was an element in its own right during his experiments with platinum. Wollaston decided to name this new element “palladium” in honour of an asteroid that had been discovered two year prior and had been baptised “Pallas”. In Ancient Greece, “palladium” was also the name given to wooden figures dedicated to the goddess Pallas Athena. They were considered as particularly sacred and worthy of protection. Its density is 12 gr/cm3, (compared to 10.5 for silver, 19.32 for gold and 16.6 for tantalum). In other words, it means that a palladium jewel will have approximately the same weight as a silver one. Palladium’s melting point is 1555°C. For comparison, gold melts at 1064°C, silver at 961°C, iron at 1538°C and tantalum at 3017°C. It is a precious metal of the platinoid family – metals from the platinum mine – as is rhodium (Rh), iridium (Ir), ruthenium (Ru) and osmium (Os). It does not oxidize. Palladium is quite hard; it is at 5.5 on the Mohs scale of mineral hardness, whilst platinum is at 4/4.5 on the same scale, gold at 2.5/3, silver at 2.5, steel from 4.75 to 8, titanium at 6, and tantalum at 6.5. So how do you get white gold? Pure gold is a yellow metal. When it is combined with other metals, you can obtain a whole range of colours – yellow, pink, copper red and grey (Black gold is fake marketing – you can read this article about black metal). 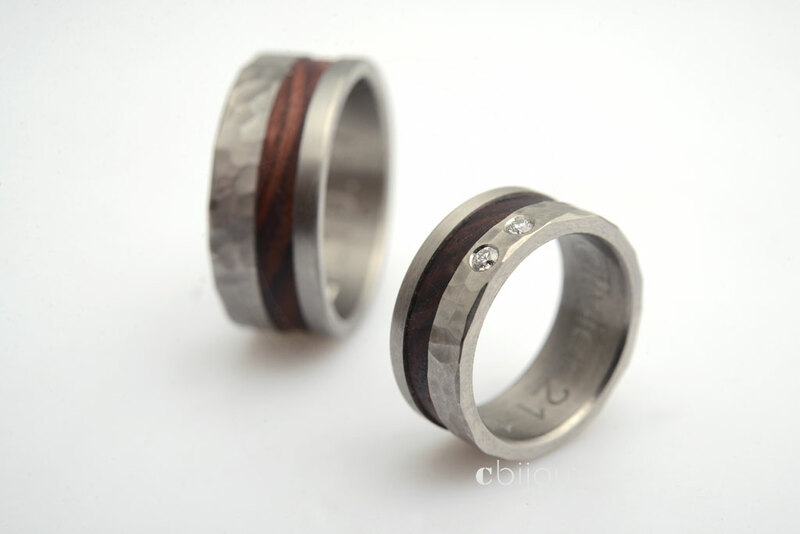 As you can see on these pictures, palladium can sometimes be made darker (see striped rings), or lighter (see smoother, satin finished rings) or very light when polished (rings with carbon). To have a better understanding of the different material aspects and finishes, read this article: aspect and finishes. It may not be clear to you how a metal can vary in its clarity. Why does palladium seem to be a good choice for creating precious metal wedding rings or engagement rings? Palladium is a precious metal, from the platinum family; it is cheaper than platinum or white gold. However, its price has been rising for the last ten years, it was around 5000€/kg in 2008 and it is now around 30’000. The price of a pair of palladium rings compared to the same platinum pair will be cheaper even though the prices of these two metals meet. Why? 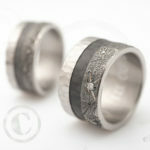 Because the pair of palladium rings will be nearly half as heavy, so nearly 50% less material cost. Here is a list of metals in price order increasing from left to right: Steel, titanium, chromium-cobalt, silver, tantalum, palladium, gold, platinum. It is a neutral grey metal, no yellow tone, no change in colour throughout the years. However, palladium is slightly less light than platinum. Here, you can learn more about the difference between palladium and white or grey gold. You will understand why I have never created a pair of white gold wedding rings, but only create grey gold wedding rings without plating. Palladium is not very heavy, which can be pleasant to wear. The weight of a palladium wedding ring will be almost the same weight as the same silver ring, but will be lighter than a platinum or gold or tantalum ring. It will be heavier than a steel or titanium ring. From the lightest to the heaviest: titanium, steel, silver, palladium, tantalum, gold, platinum. Again, palladium is good; it will be durable. Not as much as steel or titanium, but it will resist scratches a little like gold and will age much better than white gold. Palladium is actually the metal I recommend to best meet these criteria: precious metal, neutral grey and resistant/durable. For a choice of pure durability, with no particular desire for a precious metal, I suggest a chromium-cobalt alloy instead, which has a very light colour, identical to palladium, but much harder and cheaper. 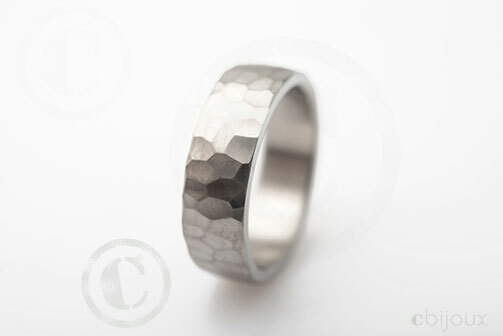 So there we are, this was some of my advice and data on creating wedding rings in palladium. The right decision can only be taken by making our own judgment/criteria meet with the right data – clear and well understood. My goal, in writing my articles is to allow the novice to understand a little more about jewellery and its secrets. I am convinced that by sharing my knowledge and advice with you, we will then be able to create, together, your ideal pair of rings, according to your different criteria, whether it be shape, aesthetics, ergonomics, aspect and of course, last but not least: the price! Your servant, Cedric Chevalley. 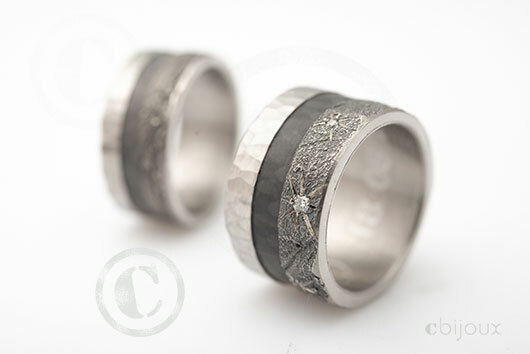 I have been signing my wedding and engagement rings since 2001 with “cbijoux”. One, or sometimes two qualified employees assist me. 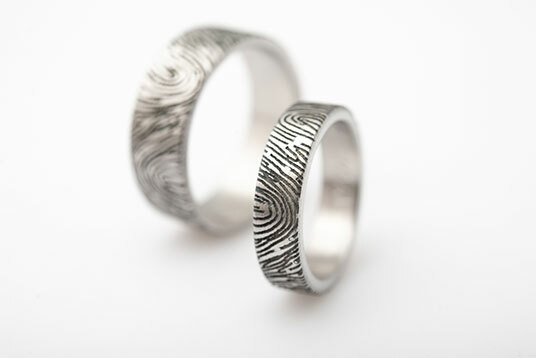 We create more than 200 wedding rings per year, which are all unique. 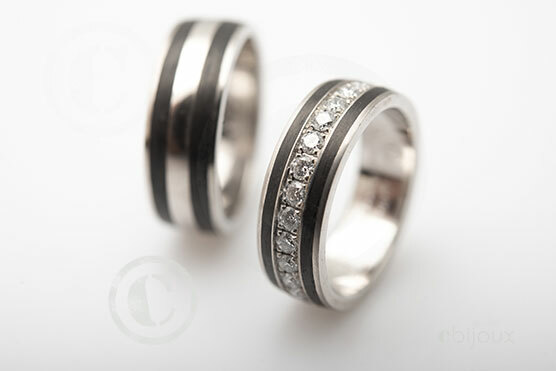 Here, you can read an article on how we create wedding rings with you. I also founded the mood collection ring brand in 2004 and handed it over to two friends in 2013. 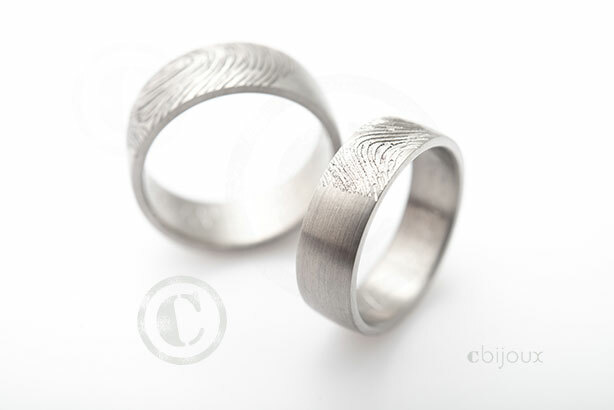 I also create contemporary jewellery (watch out, it’s unusual…) under my own name this time. 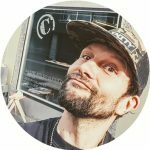 You can see more about my background and history by browsing the Facebook page (you’d make me so happy by liking it) and also by visiting my artist page here. There, I hope I have allowed you to see a little more clearly, and to move forward towards the realization of the creation of your dreams. I remain at your disposal for any further questions, with pleasure!